A Chinese fishing trawler, Minjinyu, collided with a 1,349-ton Japanese patrol boat, Yonakuni, near the Diaoyu Islands in the East China Sea on Tuesday. Two other Japanese patrol boats then reportedly chased and hit Minjinyu, and six Japanese personnel boarded it when it stopped and questioned the Chinese fishermen. Later on Tuesday, several Japanese government departments, such as the Cabinet Secretariat, the Coast Guard and the Foreign Ministry, held emergency meetings, after which an arrest warrant was reportedly issued against the captain of the Chinese fishing trawler for what they describes as obstructing law enforcement. A senior Japanese official said the captain, a 41-year-old Chinese national, "will be taken to prosecutors or police and will be (questioned) under Japanese procedures". China's Foreign Ministry has expressed grave concern over the incident. Vice-Foreign Minister Song Tao summoned Japanese ambassador to China Uichiro Niwa on Tuesday and lodged "solemn representations" with the Japanese side. At a regular press conference, ministry spokeswoman Jiang Yu said: The Diaoyu Islands and their adjacent islets have been Chinese territory since ancient times. She urged Japan to stop its so-called law enforcement in the waters off the islands and refrain from taking any action that would threaten the security of Chinese fishing boats and their crew. "We will follow the situation closely and reserve our right to take further action," Jiang said. The Diaoyu Islands are a group of uninhabited islands, comprising mainly the Diaoyu Island, and smaller islands such as Huangweiyu, Chiweiyu, Beixiaodao and Nanxiaodao, as well as three large reefs, covering an area of 6.3 sq km. Of all the islands, Diaoyu is the largest with an area of about 4.3 sq km. The Diaoyu Islands have been recorded in Chinese historical documents as Chinese territory since the Ming Dynasty (1368-1644). The Japanese government, however, regards them as a part of the Okinawa prefecture, which was under the independent Ryukyu Kingdom until 131 years ago. China had friendly relations with the Ryukyu Kingdom for about 500 years, before Japan annexed it. And more importantly, China was the first to discover and name the islands Diaoyu. There are records about the islands in a book published during the reign of Ming Dynasty emperor Yongle (who reigned from 1403 to1424), more than 400 years before 1884, when Japan claims to have discovered the islands. The Diaoyu Islands have been part of Chinese territory since ancient times, and China enjoys indisputable sovereignty over them. This is not only the Chinese government's stance, but also the conclusion of Japanese historian Kiyoshi Inoue. In the Historical Facts of Senkaku Islands/Diaoyu Islands, published in 1972, Inoue says that historically the Diaoyu Islands belong to China. He emphasizes that before Japan's encroachment, the Diaoyu Islands were not terra nullius but China's territory. Before Japan began the Meiji restoration in 1868, no documents could be found in that country or the Ryukyu Kingdom that mentioned the Diaoyu Islands without citing Chinese documents. Japanese Chief Cabinet Secretary Yoshito Sengoku told a news conference on Wednesday that arresting the Chinese captain was in line with Japanese laws, and there was no need to take recourse to diplomacy because the Japanese government did not have territorial disputes with China over the Diaoyu Islands. Tokyo's explanation shows its wild ambition to take forcible possession of the Diaoyu Islands in steps and this is open defiance of China's sovereignty and territorial integrity. The Chinese Foreign Ministry and Chinese embassy in Japan have demanded immediate release of the ship and its crew and guarantee their safe package back home. The Chinese government is taking all necessary steps to protect Chinese people's life and property. 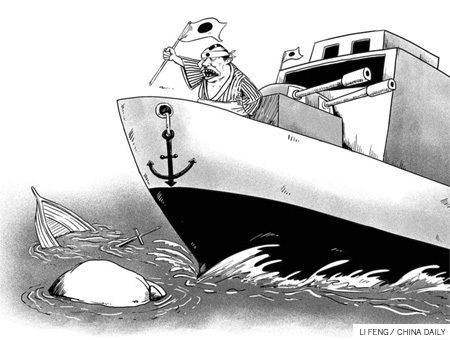 Japan infringed upon China's sovereignty when its patrol vessels intercepted and inspected the Chinese finishing boat, and arrested its captain. Japan should know that it would set a bad example if it charges the Chinese trawler's captain according to Japanese laws. China should intensify its patrol off the Diaoyu Islands to protect Chinese fishermen, too, and it should never compromise its sovereignty and integrity. The author is a special guest commentator for China Daily.